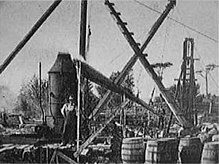 Curse of Oak Island - They Reach the Bottom of the Money Pit? There was no treasure. There were no hidden manuscripts. 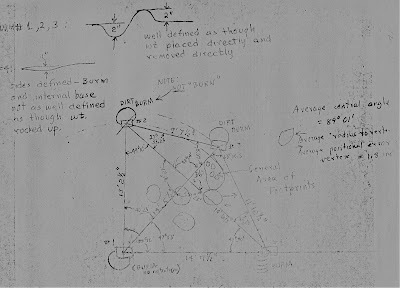 There was no vault, though there did seem to be a void which didn’t prove much of anything other than there was a void that they thought might have been the vault. But they reached the bottom, something that no one else had been able to do… and they found nothing. Why, of course not. They decided that they missed because they were slightly off the mark. After all, they had that little iron cross that seemed to match those created by the Templars they had found on the beach a few days earlier. They had those bits of manuscript, bone and pottery that were buried far down suggesting something real was hidden there. They had that spike. All this suggested to them that the treasure was there. You have to hand it to them for tenacity. They’ve spent millions (or someone has) and they haven’t had much of a return on the investment, at least from the money pit. I don’t know how much of their own money the Laginas have spent, or how much of their investors money has been spent and I don’t know how much they’re paid for their appearance on the show or really any of the financial details, but someone is making money here. If they weren’t, last week would have been the last show. Instead, well, there’s some money left in the bank so let’s just move the equipment, what, twenty feet to the right or left and do it all again. I really do hope they find treasure. I’ve been interested in the money bit since I stumbled across the information in an old book that I bought in the late 1960s. As I have mentioned, it had a segment on the money pit. And I read D’arcy O’Connor’s The Big Dig, when it first came out in paperback in 1978… but I fear the Laginas have solved the mystery of the money pit and the solution is that there is no money pit (other than millions that have been thrown into the ground for the last two centuries). I’ll be around to the end of the show, though I think we’ve already seen the end. Everything that follows is just anti-climax. 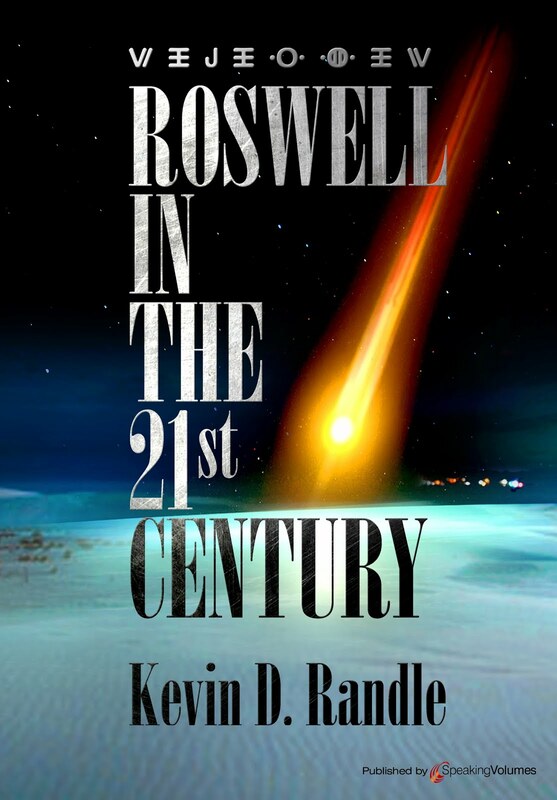 The UFO community has had to put up with fake news for much more than a century. In 1897 there were a number of Great Airship stories that were printed by newspapers. The reporters and editors had to know that some of them were fake, but the interest was there, the stories were there and the bottom line is that newspapers need to make money. Hype a story that doesn’t deserve it, add details that the reporters invent and a few quotes to make the story better or just make it up completely. 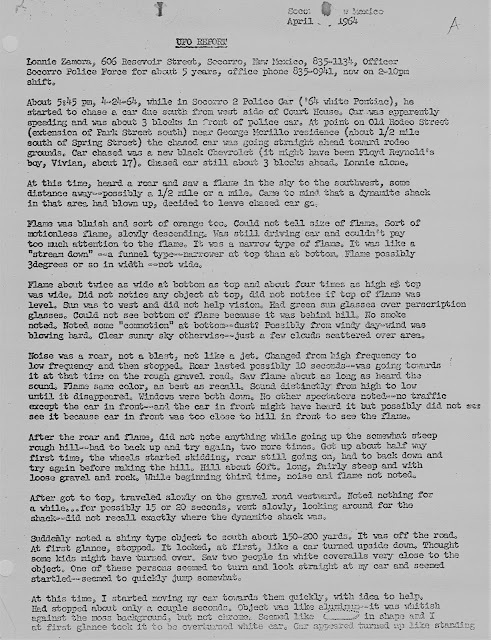 I am convinced, by the evidence, or the lack there of, that the Aurora UFO crash of April, 1897, is a hoax begun by a newspaper stringer who wanted to do something for his town. 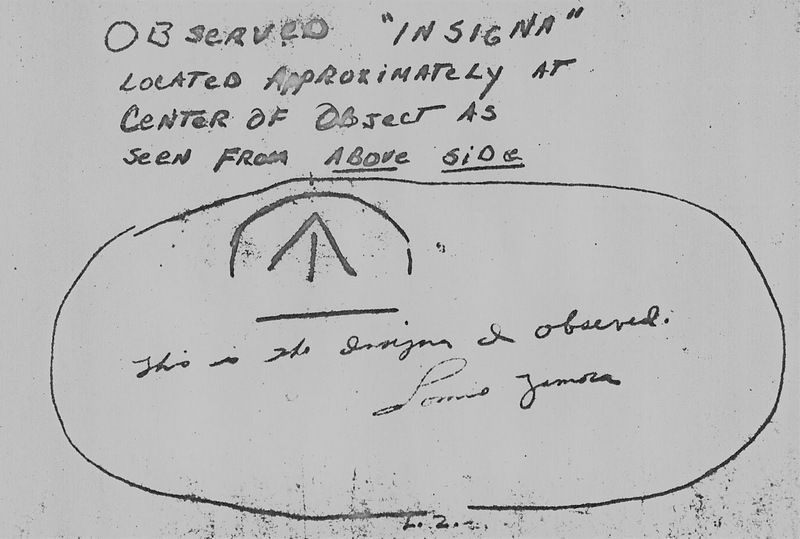 Beyond the story printed in 1897, there isn’t much evidence of the airship crash, until UFO researchers became involved in the 1970s. The point here, however, is that in today’s world, this would be labeled as fake news. 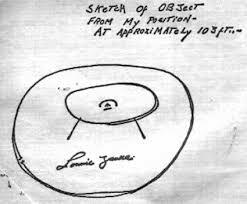 To bring this closer to us, here in 2018, and keeping with the theme of the last few posts, I looked at the La Madera UFO landing. 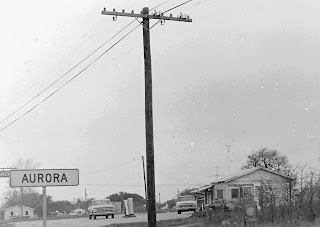 This was a sighting that took place in the hours after the Zamora sighting, and by hours, I mean something like 30 hours after the landing in Socorro. 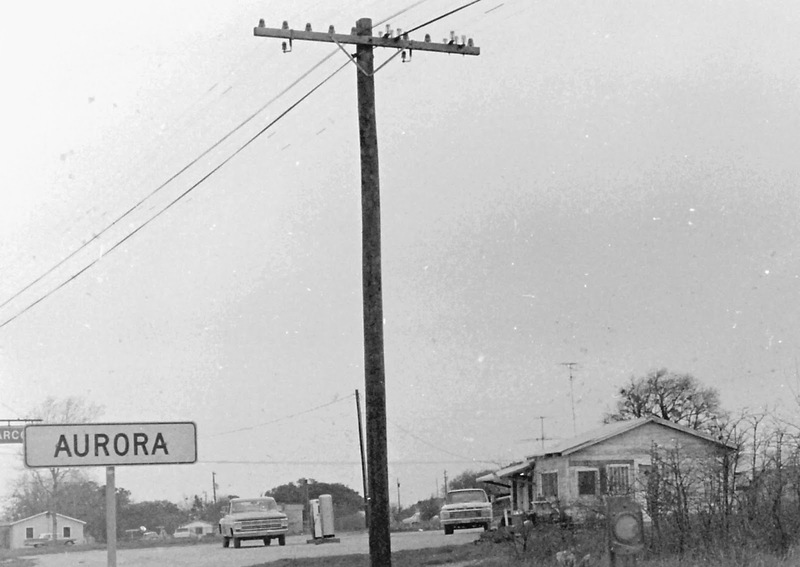 Orlando Gallegos said that just after 12:30 a.m. on April 26, 1964, he had gone outside and about 200 yards away, saw something he told Sheriff Martin Vigil, looked to be as long as a telephone pole and as big a round as a car. 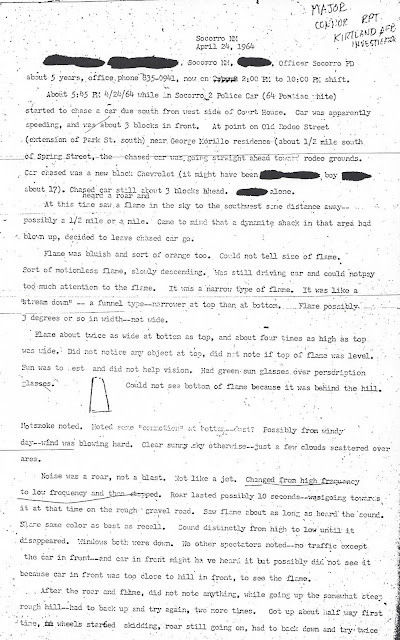 He said there was a bluish-white flame all around it and as Gallegos watched, the flames went out. 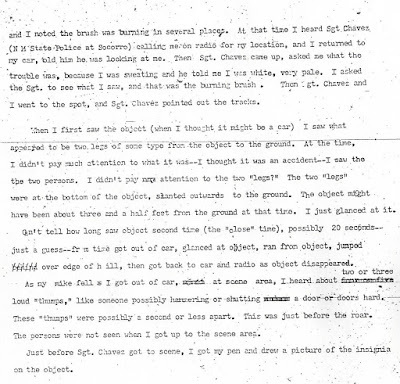 I provided a long report on this sighting in Encounter in the Desert, for those who wish to learn more about the case. There is one other thing to say about all this. I have been accused of misquoting people on a number of occasions, but those allegations were untrue. I had taped the interviews and the transcripts reflected what I had said they said. J. 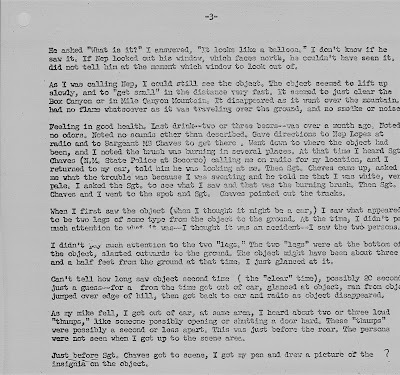 Bond Johnson, the man who took most of the photographs in General Ramey’s office after the Roswell story broke in 1947, said that I had misquoted him on a number of points. 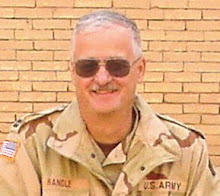 When I read the transcripts to him over the telephone, he said that he hadn’t said those things because they weren’t true. He was convinced that I had misquoted him and he wanted to hear the tapes so he could prove it. I sent him an edited version so that he wouldn’t have to sit through the whole four hours of interviews, but that had the quotes on them. His response was to say that I had admitted to editing the tapes and he couldn’t find all the quotes. 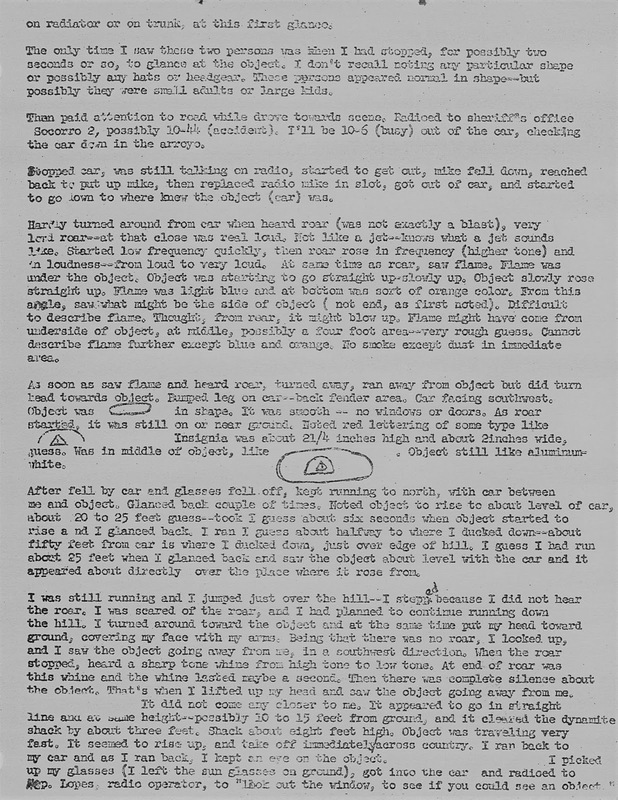 So, I sent him all four hours, plus the transcripts, twice, and the best he could do was show that I had left an unimportant conjunction out of the transcripts. 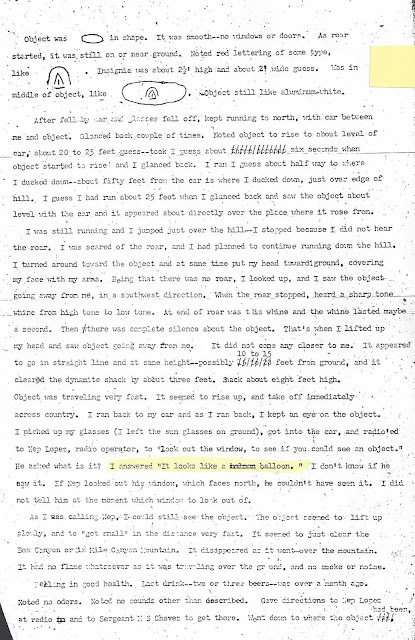 That, of course, didn’t satisfy him and even though he had the tapes, he continued to say that I had misquoted him. He had gone from telling the truth in the interviews I conducted to an assault on me, even when he knew he was wrong. The point is that sometimes, when people don’t like the direction of the quotes, they claim to have been misquoted. Here, with Vigil, I see no reason he would claim to have been misquoted on something as innocuous as the last line in the story unless that was something that he hadn’t said. The quote is a nice wrap up for the story, a good final line, and the impression of the reporter might have been that Vigil felt that way, but Vigil said he didn’t say it. At least he said he hadn’t said it. Is this overly important to the overall story? Not really, other than give us a look at something that in the world today would be called fake news. Vigil didn’t seem overly upset by the quote given his reaction to it. But it also demonstrates that we, as investigators, researchers, writers, and proponents of a point of view must get this stuff right even when it is something as inconsequential as that last line. E must be careful or we can damage all the work we have done. Let’s try this one more time. 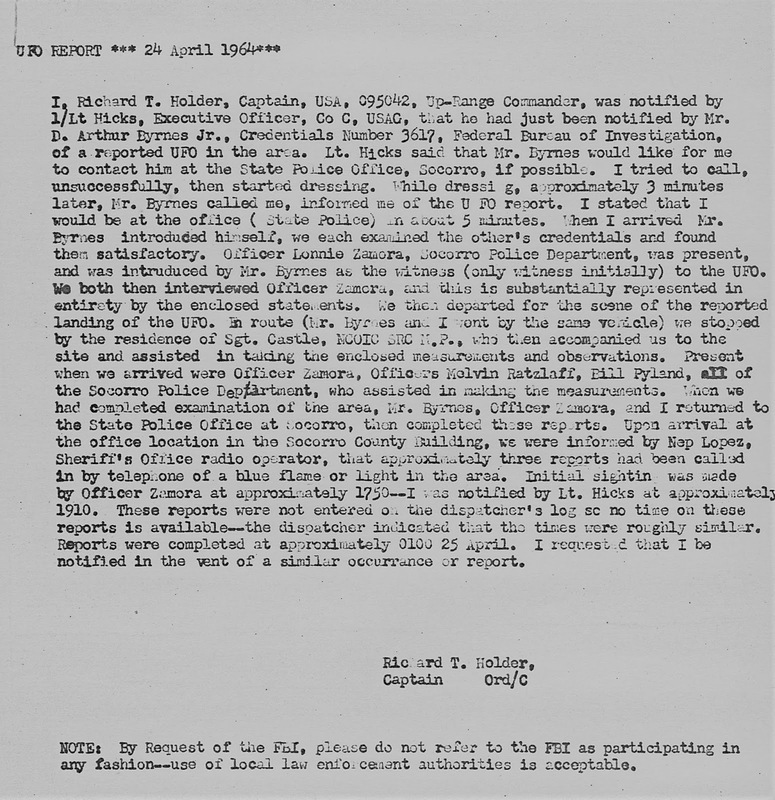 I had found a reference to a five-page report written by Captain Richard T. Holder in a letter written by Dr. James McDonald. 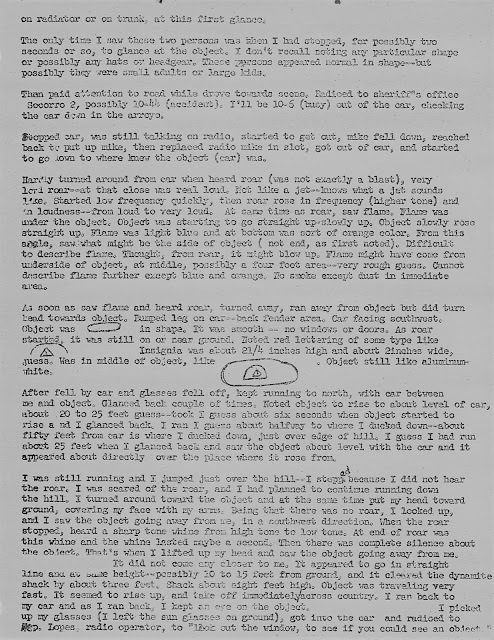 When searching for the documentation, I was using a Xerox copy of the Project Blue Book file, which, I have learned, was somewhat jumbled. 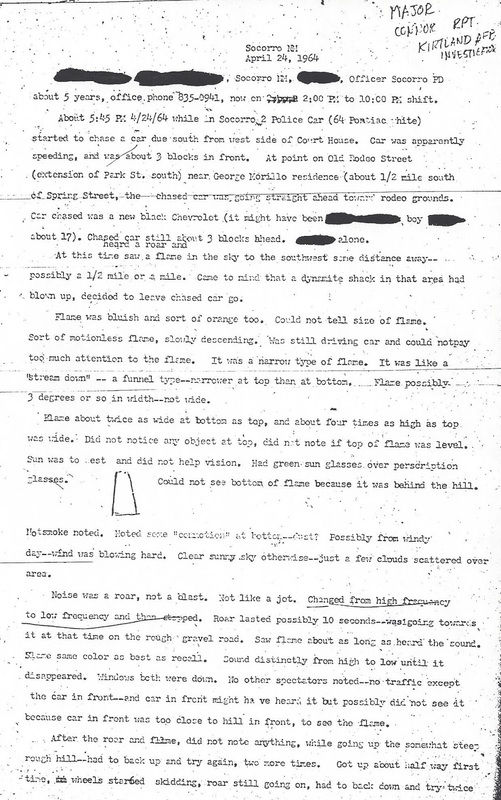 I was interested in this five-page report because I could find no such report in the Blue Book files. I believe I have now sorted this out and can say, “There is no five-page report.” That means that I have found the documents and they run to more than five pages. I wonder where McDonald got the idea there were only five pages. 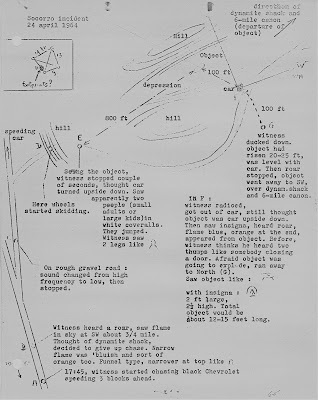 Searching through the Blue Book documents that were recovered by former Project Blue Book officer, Carmon Marano, which seem to be everything that was in the official file, I found a “table of contents” for a section in a folder inside the original folder also labeled with the date. 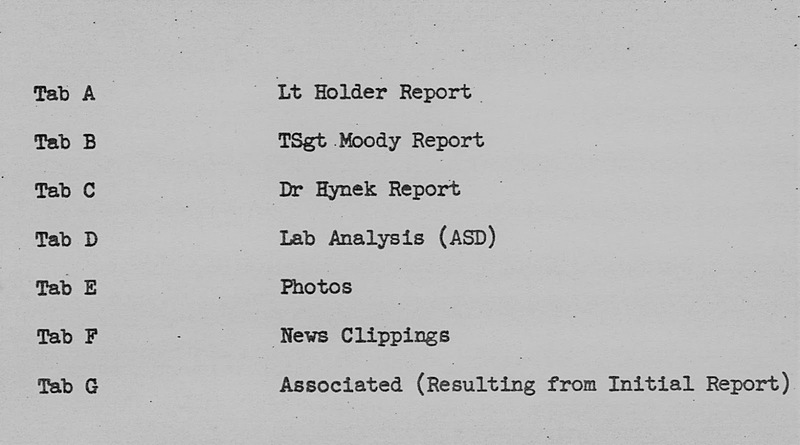 That table of contents labeled the tabs, the first of which was Tab A, Lt. (sic) Holder report. 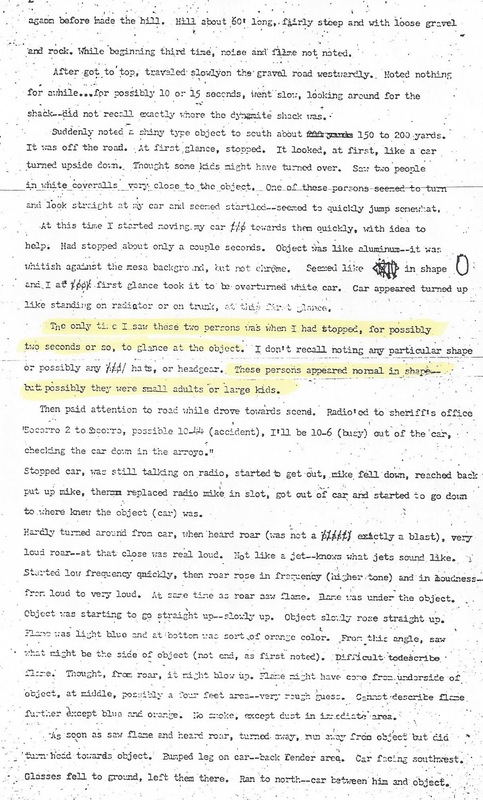 That was everything that I believed was part of that original report, plus several other documents. 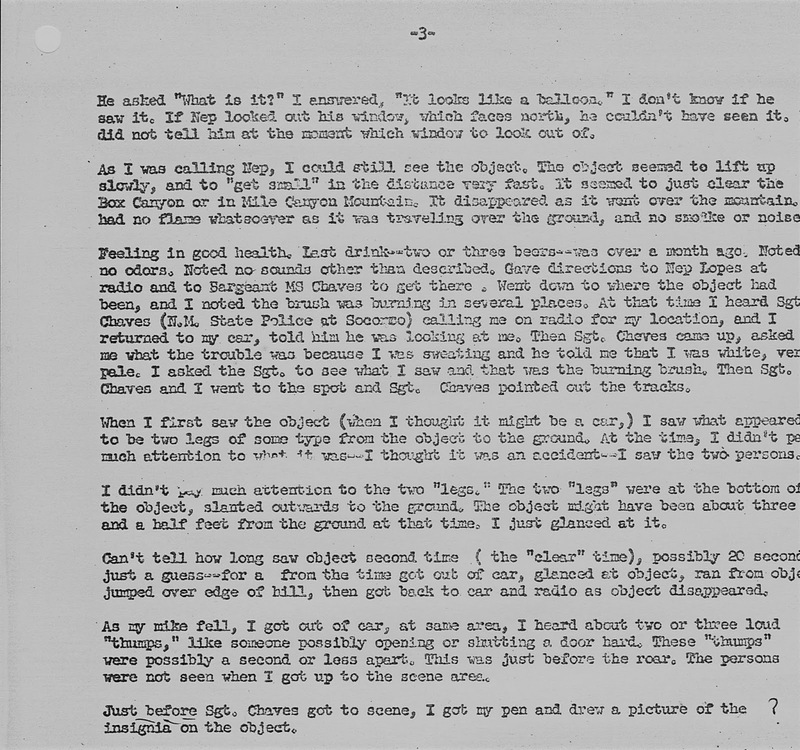 Following, are the images of that whole section of the Blue Book file. 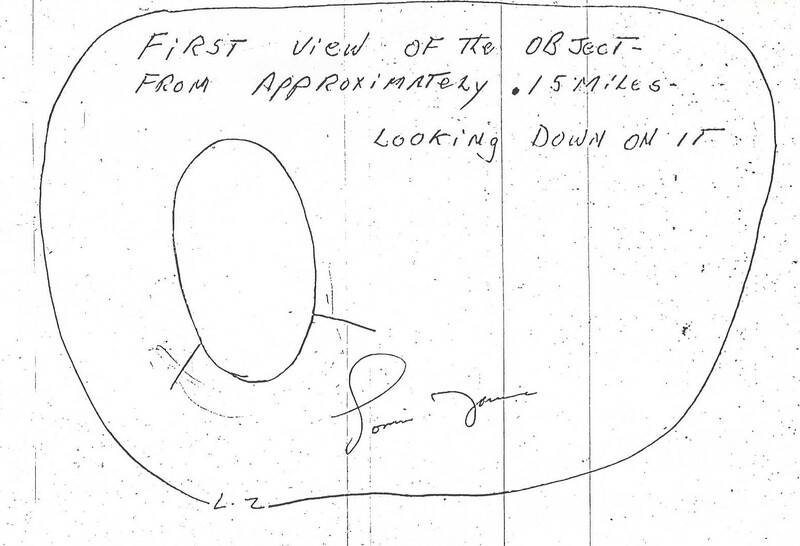 It is clear that the handwritten notes on the drawings made by Lonnie Zamora were made by Holder and that the illustrations were made on the evening of April 24 and in the early morning of April 25. Notice that Zamora did sign them. 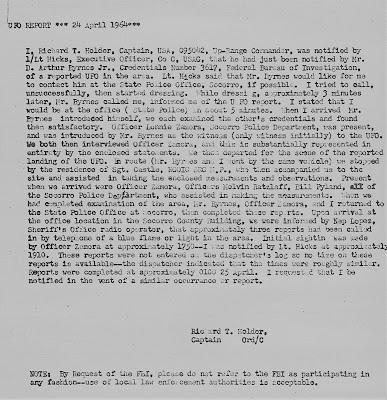 Following is a three-page report that is credited to Holder. 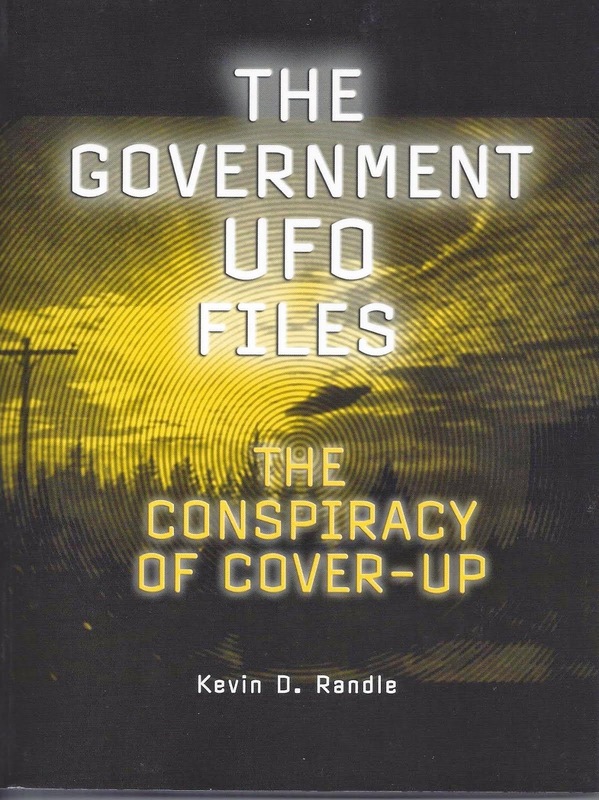 It is nearly the same as another report credited, in the Xerox file that I have, to Major William Conner, who was the UFO officer (as well as a public relations guy at Kirtland AFB). What I believe happened is that Connor used the Holder report for the basis of his report, though I’m not sure that I understand the rational for it. He added nothing to the report that would suggest a reason for retyping it. 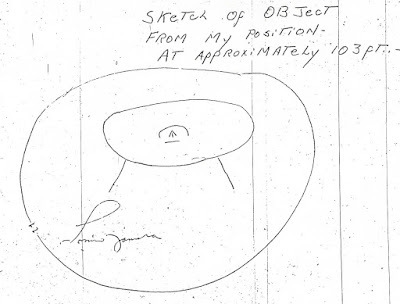 It is clear, from the small illustrations in Connor’s report, that they are not the same (meaning here the oval is larger, the symbol is more compact and the final image has a symbol on it that seems to be a hybrid of the description). 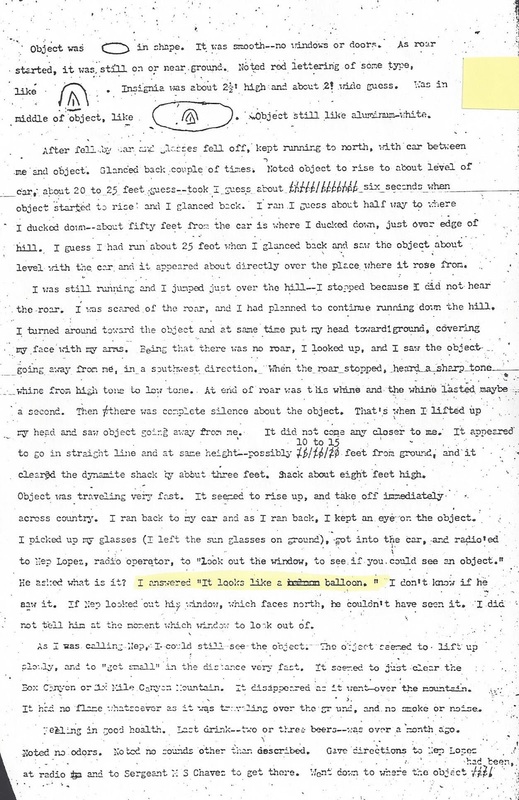 Other than some minor changes, and the names having been redacted from Connor’s report, but not in Holder’s, this is a transcript of the interview with Zamora conducted by Holder and Brynes that first night. 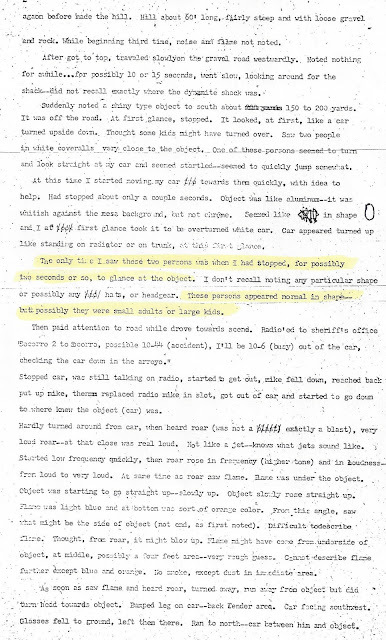 For comparison, here is the report attributed to Major Connor so that you all can see for yourselves what the differences are. This, I believe, should be the end, the very end of the episode. Had it not been for McDonald’s mention of the five-page report, I’m not sure that I would have been able to put all this together. Again, there are many people who contributed to this including Carmon Marano, Ben Moss, Tony Angiola, Rob Swiatek and Rob Mercer. I have used the Project Blue Book microfilms, the Fold3 website, the Xerox copy provided to me by the J. Allen Hynek Center for UFO Studies, documents retrieved from the files of Dr. James McDonald and a couple of anonymous contributions. This wouldn’t have been possible if not for the Internet and the cooperation of the people named here… and couldn’t have been done anywhere as quickly without these resources. Yes, this is something of an exercise in futility... 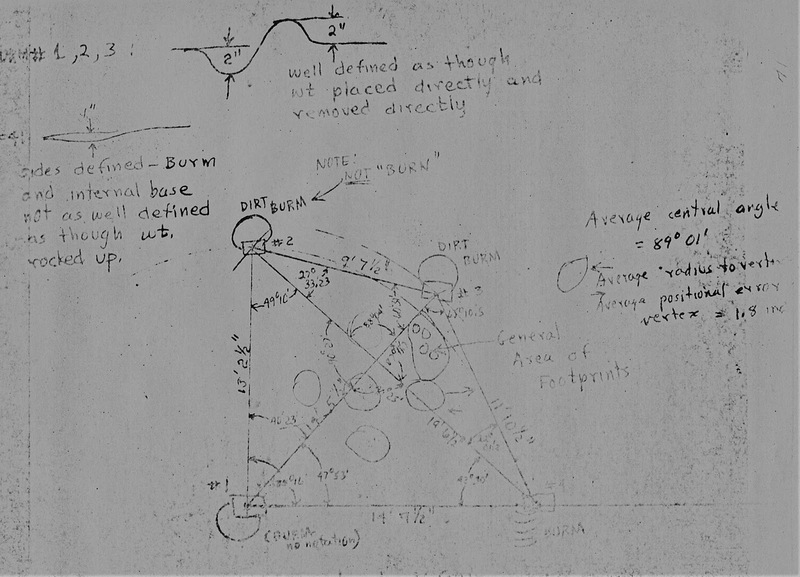 Since the question came up about the available moonlight on the Socorro landing site on April 24, 1964, I thought, for fun, I'd see if I could find the data. Took about five minutes, but for those of you interested in such things, here it is. Phase of the Moon on April 24, 1964: Waxing Gibbous with 96% of the Moon's visible disk illuminated. 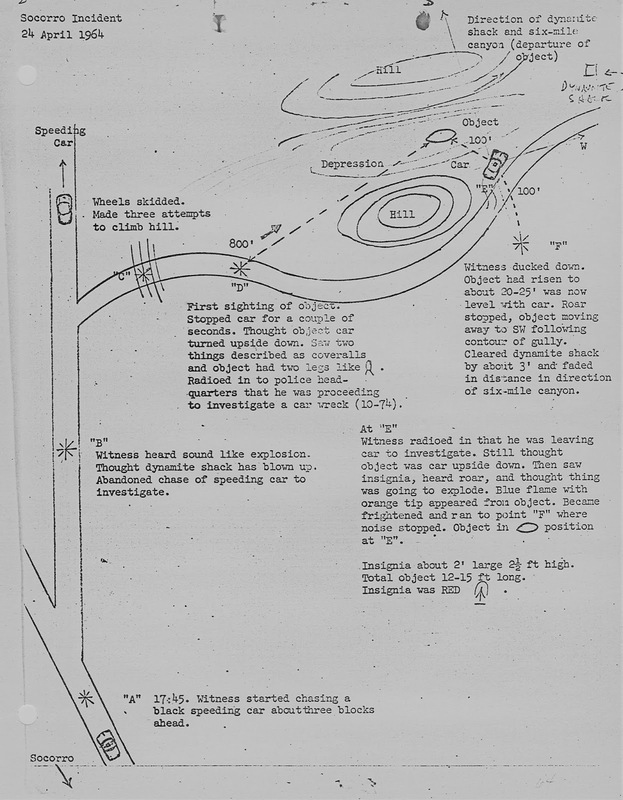 Those of you who have followed this research know that I had found a reference to a five-page report written by Captain Richard Holder about the Socorro landing. 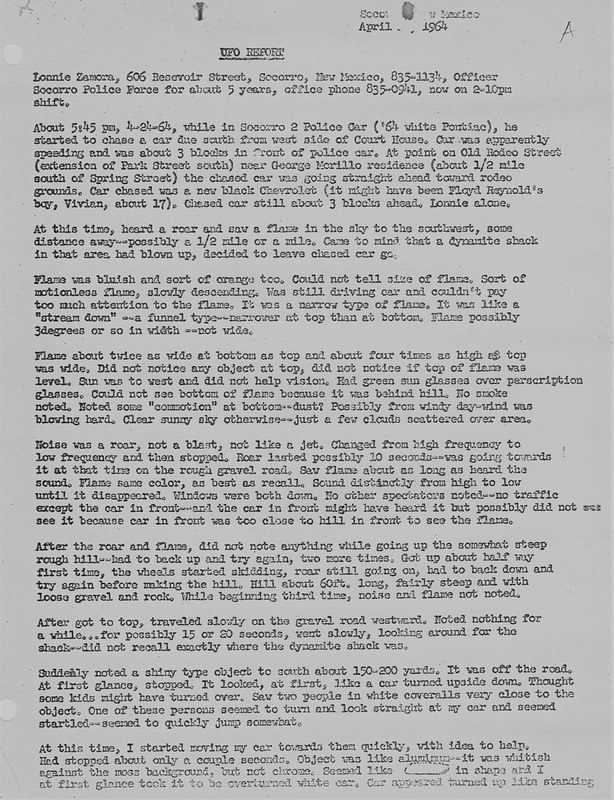 There was, in the Project Blue Book files, a single-spaced report that covered about half a page. The bottom was blank and it was clear that the pages that followed were not those written by Holder and not part of that five-page report. 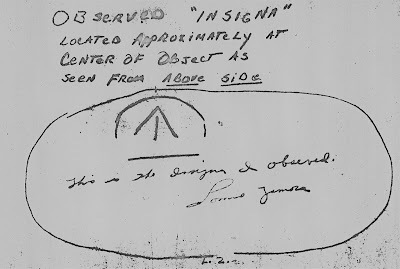 This matches, to a large degree, a statement that does appear in the Blue Book file but one that is attributed to Major William Conner, the UFO officer from Kirtland AFB who apparently didn’t arrived until some 96 hours after the sighting. Comparing it to that of Holder, I find that some of the strikeovers do not match and there are a couple of other differences. 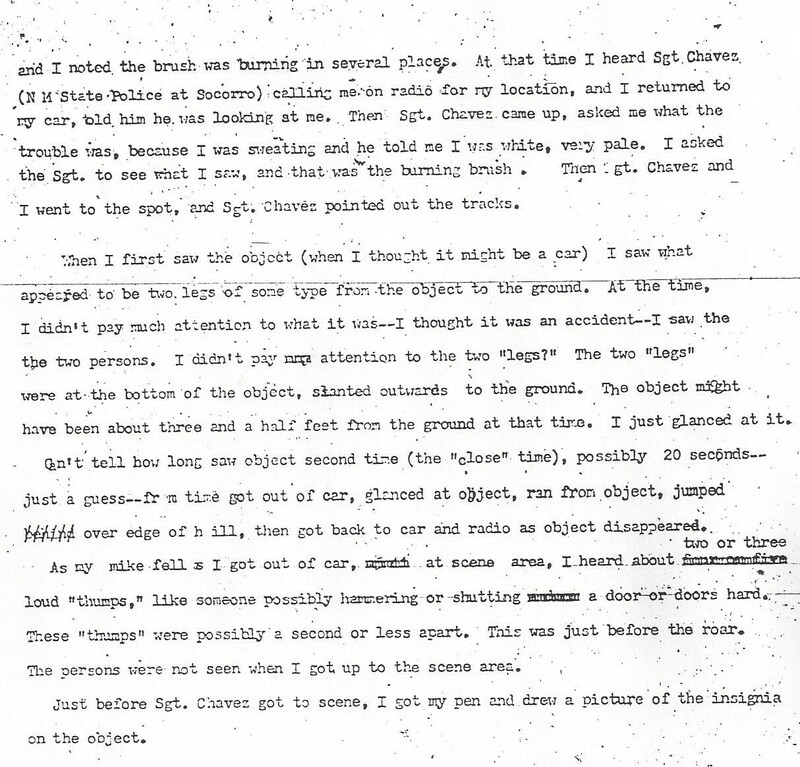 It would seem that Connor had the report retyped and then probably gave it to Dr. J. Allen Hynek to take back to Blue Book. I don’t think there was any attempt by Connor to deceive anyone. He was just supplying information. So, what I had suspected and now know, Connor’s statement which did not include much in the way of identifying information about who was speaking and how it was obtained, is that it was an interview with Lonnie Zamora. 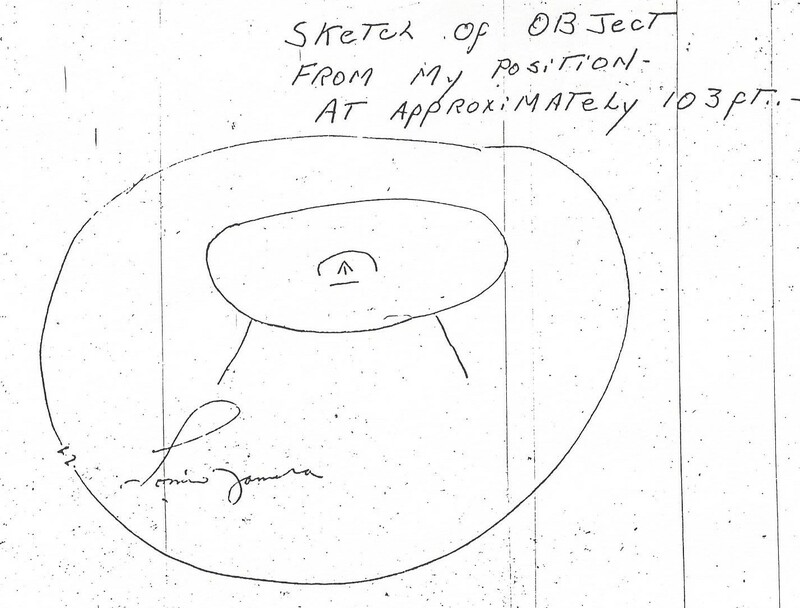 The notes were taken by Holder and might have been supplemented by FBI agent Arthur Byrnes. The version I now have included Zamora’s home address and telephone number which had been redacted in the version found in Blue Book. 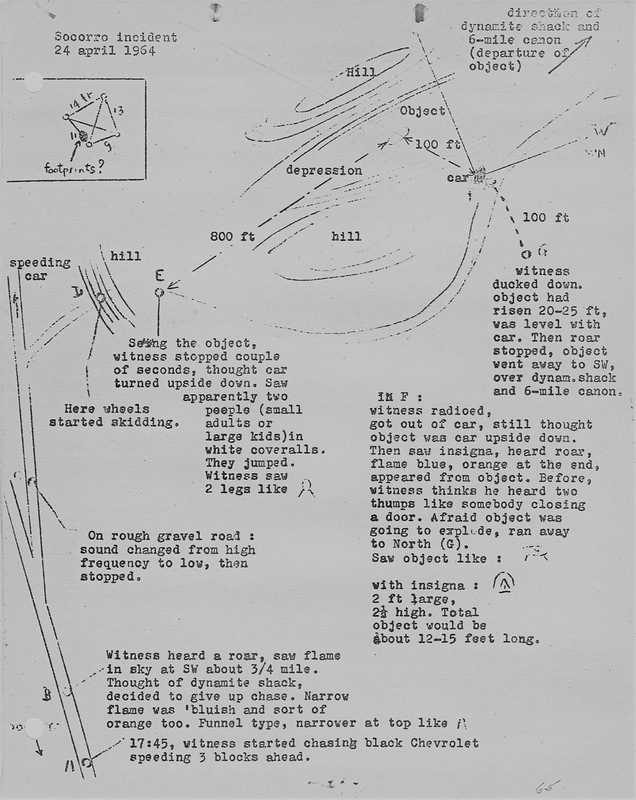 The fifth page, which I don’t have, but given this information, was probably one of those illustrations found in the Blue Book file that had been signed by Zamora. 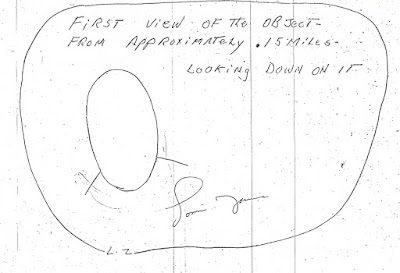 And, given that at the bottom of the last page is a small illustration of the craft, I suspect the missing illustration is the one signed by Zamora that included the symbol as seen by him. There is nothing in Holder’s report that isn’t found in Connor’s copy of it, so there is no reason that Holder’s shouldn’t have been included in the Blue Book file. It wouldn’t be the first time that information had been duplicated. 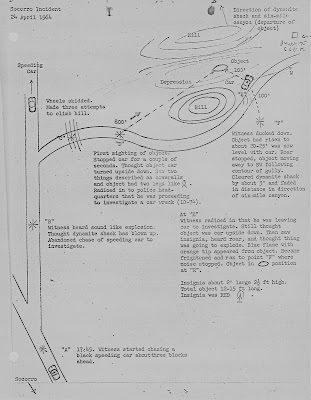 Anyway, I have, to my satisfaction, solved the mystery of the missing report, which I wouldn’t have been able to do with the help of Rob Swiatek, Ben Moss, Tony Angiola, Rob Mercer and Carmon Marano. I will now close the book on this area of the investigation and hope that I don’t have to open it again.